Well. What a weekend! 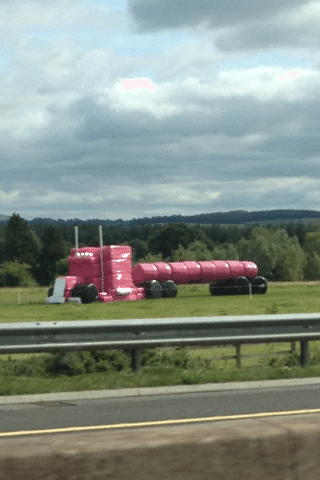 And you know, Longford is so easy to get to from abroad. Fly into Knock or fly / ferry into Dublin. Really comfortable (and seat-belted) buses run from Busaras (the central Dublin bus station) or Dublin airport every couple of hours – it’s direct, cheap as chips and takes about 2 hours.
. . . and actually what a summer! 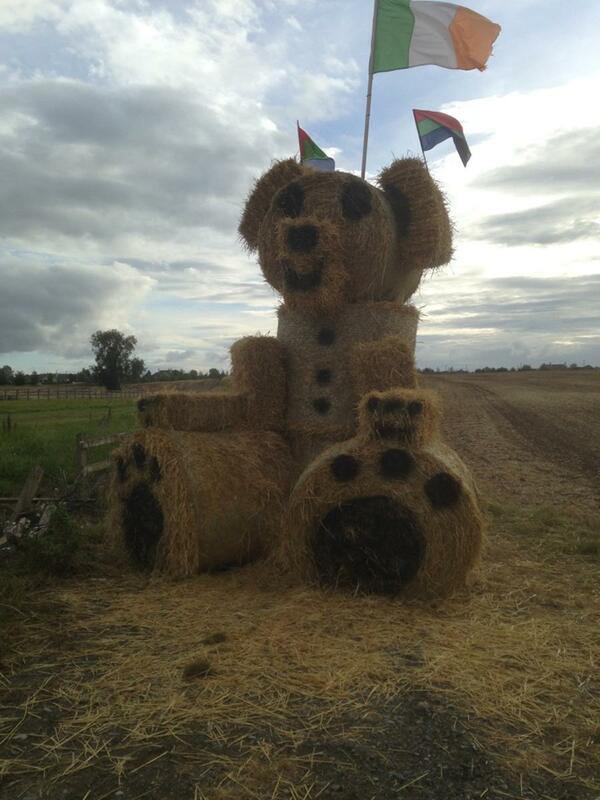 Not that we had one, weather-wise, here in soggy Roscommon but we certainly had a lot of fun! 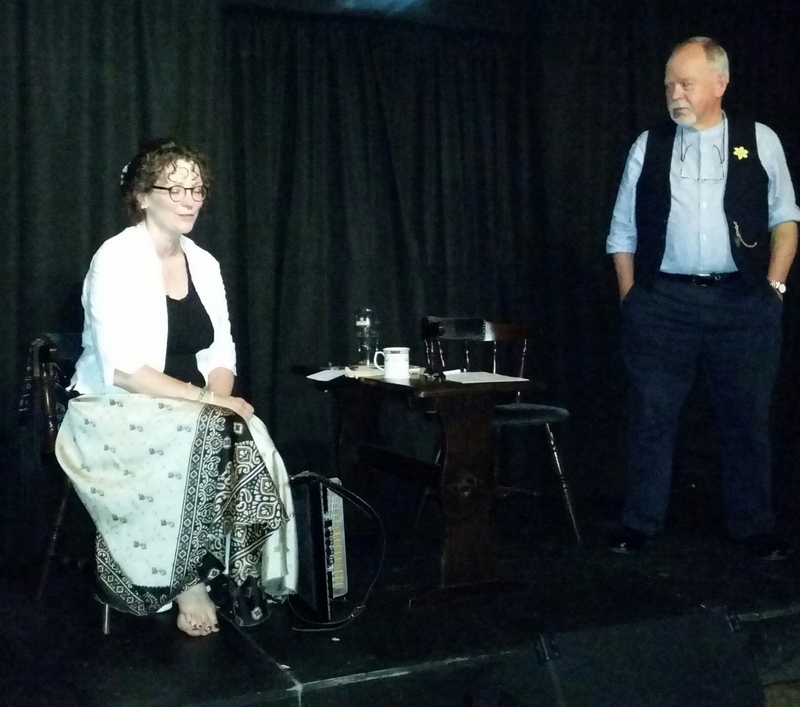 Last weekend was Iúr Cinn Fleadh 2015, or the Iúr Cinn Fleadh/Newry City Music Festival which put the spotlight on local talent from Newry City and surrounding areas as well as drawing in internationally acclaimed artists from further afield. There was an extensive ‘Trad Trail’ of early evening and late night music sessions taking place across a range of the city’s pubs and clubs. Hailed as the home of Irish music in Newry, The Railway Bar hosted the opening of the Fleadh on Thursday 10th September. I was involved in sessions and Saturday’s musical workshops – we had a great play and discussion about session tunes and the unspoken rules of sessions. – when joining a new session, respect the people who are already there; their repertoire / choices. Don’t try and take over. – it’s all about comfortability, playing a good amount of accessible tunes that everyone is likely to know and be able to join in with. It’s OK to have fast sets, but be aware of those looking sheepish, worried (no pun intended!) or shy – sometimes just having some slower tunes or sets played at a more moderate pace can be a great help for inexperienced session players. Don’t forget to play hornpipes, set dances, planxties, waltzes etc. 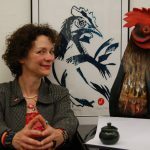 – there also needs to be sets of tunes played briskly (to illustrate what we’re aiming for) as well as the odd solo, song, story and I feel that this whole ‘play the tune twice and change’ lark is pointless. John Kirkpatrick and Rodney MIller (two of the finest) also agree that a tune can easily be played several times so that you really start to get to know and explore the tune. Plus it gives those who don’t know it, time to listen and learn. At the Newry workshop I played a new tune (a jig) at a moderate speed a which was pretty easy to pick up. I played it 8 times before people in the workshop were starting to get a handle on it. We didn’t have to stop and, in learning it ‘on the hoof’, their mind knew the navigation of the whole tune, not just the A part or bits of it and not a jot of notation in sight. I could’ve happily played it another 10 times. After all, a fine tune is worth playing again and again, isn’t it? – the final thing we agreed on is respect. If someone starts a tune, it’s often nice to allow that person once through on their own to establish it and then join in if you know it. It respects their playing and how they would like the pace to be. 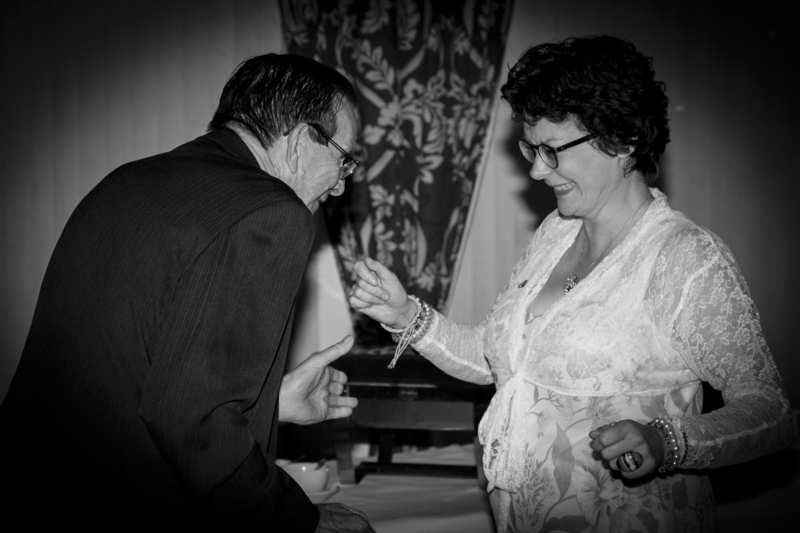 Sessions for me are about listening, learning, socialising and celebrating music. It’s not a music class nor a competition and I feel that all too often these days, people can get cross if a session (that they don’t organise nor commit to on a regular basis) is either ‘too fast’ or with ‘tunes they don’t know’. My answer to that is ‘start your own session’. An ad in the paper or a mention on local radio or a poster in a library is all it takes. And then you can have the session of your dreams as long as you have patience, a nurturing attitude and a zero-tolerance attitude regarding peoples’ politics. Be sure of the function of the session you require and you’ll find it. It may take a little while and a bit of research, but you will. Since my recent health issues, I’ve been enjoying going to dances and sessions and taking my sketchbook rather than my accordion. Listening is a great tool and sharpens your ears, so don’t forget to stop playing sometimes and just listen. OK – enough of my opinions. Go on and get a session started. . .altho it is much easier to sit in your armchair and complain that there’s no decent sessions for miles, eh? The Newry festival is run by a committee of volunteers, led by Columba O’Hare. “Iúr Cinn Fleadh provides the ideal platform for recognising and celebrating the very rich and thriving home-grown musical talent that resides within the Newry, Mourne, Down and South Armagh region. He’s a great guy with a great open heart and some fantastic ideas and while there, I met some astonishing musicians and especially loved reuniting with 3 of the great women of my teenage years of learning Irish traditional music – Annette Hannigan (nee Caulfield) and Marian McGauley (nee Caulfield) on banjos and Eileen Opie (nee Fitzpatrick) on fiddle who I used to chum around the fleadhs and sessions with, which were run by the Luton Leagrave branch of Comhaltas Ceoltoiri Eireann (CCE). 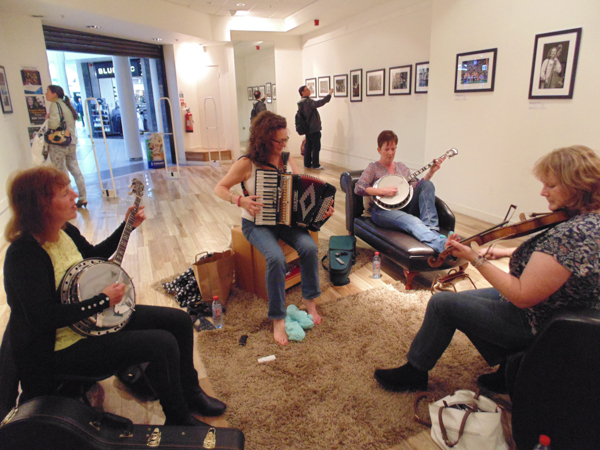 We had a great few tunes in the Buttercrane Shopping Centre, where Columba had a fine photographic exhibition. There was also a ‘Taste of Trad’ food festival with a cooking demonstration and historical walks; boat trips on Newry Canal; an evening of storytelling with Kevin McAleer, as well as the first ever International Buttermilk Drinking Competition. I’d advise booking early for next year; we stayed out in Rostrevor, just beyond Warrenpoint and the scenery is spectacular, the food scrumptious and the people so friendly. 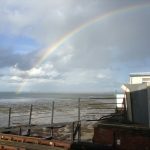 Well – looking back and looking ahead! THIS weekend there is so much going on, it’s quite bonkers. I love what the farmers get up to around here and at the end of the month there’s a tractor run!!! Can’t wait! This Friday night is CULTURE NIGHT in Ireland so there’s some amazing events going on; the Longford Collection and I have a whole weekend of activities, starting with a Friday night concert (I’m doing a bit of a guest solo half with Nick Wiseman-Ellis which will be great fun – a real musical whizz around France and Scandinavia with a few tangos thrown in, no doubt). The Longford Collection crew are playing during the first half so expect great Irish traditional music, songs and stories too from Noel Sweeney, Michael Lennon, Tom McElvogue, Donna McCann, Maritin O Muiri and many more . . . .
We’ll both be doing a bit of Irish traditional music and while I’ll be concentrating on tunes from the Bunch of Keys CD1, Nick will also be looking at music from France and Scandinavia. Crikey. After lunch, we’re delighted to have Tom McElvogue and Noel Sweeney talk about their music; how they got playing and what makes their hearts sing, musically. Two of the best flute players (in my book; I’m biased of course); this chat is only open to accordion students on the course. For me it’s a very necessary part of learning, listening to other instruments and finding out what makes the musicians who play the music I adore, tick. When my main teacher of traditional Irish music, John Whelan, emigrated to the States when I was barely 16 (and I was devastated to lose such a great teacher), he said to me that it was for the best. While I wasn’t the reason he was leaving (phew! ), if he stayed, he believed that I would become a John Whelan clone. This way, I would start to get my own ‘voice’ and one way to fast-track that, he said, was to put away in the loft all my accordion LPs (as they were then) and only listen to and play with non-accordionists. This was, he said, the way to understand the music. To listen to the instruments that pre-dated the accordion and especially the voice. So I listened to singers and uilleann pipes (Fran Meehan, Marco Pollier, Liam O Flynn), concertina (Noel Hill, Mary MacNamara), flutes (Tom McELvogue, Siobhan O Donnell, Niall Keegan, Matt Molloy, Cormac Breatnach, Kevin Crawford, Marcus Hernon), banjos (Annette Caulfield, Christine Considine, Joe Molloy, Cathal Hayden – now I’m REALLY showing my age – and Kieran Hanrahan) and tin whistles (Michael Dwyer, Peter McAlinden, Mary Bergin, Deirdre Collis) . . .
. . .but it was the fiddle that caught me. 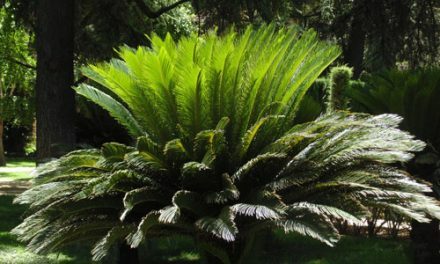 . . .which also alerted me to the harmony and basslines of my instrument because of who they played with – pianos, guitars, bouzoukis and bodhrans! 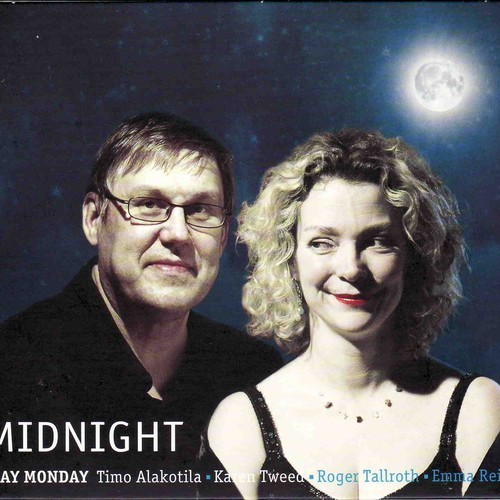 (Peter Barnes, Peter McAlinden, Margaret Robertson (nee Cooper), Triona Ni Dhomhnaill, Geraldine Cotter, Seamus O Sullivan – piano; Ivan Miletitch, Andy Irvine, Arty McGlynn, Tim Edey, Micheal O Dhomhnaill and Ian Carr – guitars and bouzoukis; Mossie Griffin, Sandra Joyce and Kevin Conneff – bodhrans. . . ). I gradually started to understand, by listening to and talking to, (where possible) and watching others, how music worked (and particularly dance music) and I just needed to imitate it, shadow it, on my instrument. The same with singers. 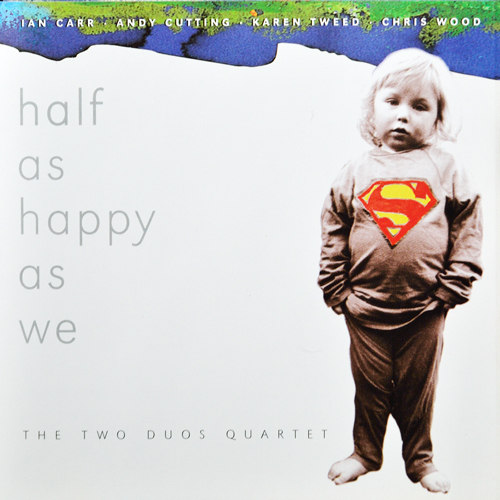 I didn’t need to understand where the first beat was; in Sean Nos singing, that doesn’t happen anyway – the singers sings songs as if they are telling a story and it’s not tied to any bar or beat – perhaps their own heartbeat? I loved the singing of Siobhan O Donnell, Dolores Keane, Maura Starkey, Frank Sinatra, Shirley Bassey, Billie Holiday, David Sylvian, Bob Fox and Stu Luckley, Barry Dransfield, Tom McConville and Kieran Halpin, Jon Strong and especially Tim Wood from Leeds. And I could have listened forever to the late Tom Conoboy’s lilting which is why I love Seamus Fay’s lilting so much now. 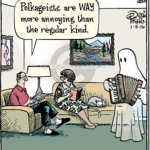 . . you really can learn as much about phrasing and musicality from someone who lilts well than any instrumental player. It’s all there, the decoration, the phrasing, the breathing. .
. . .DO get a copy of Seamus Fay’s ‘Cavan Lilter’ CD. Everything about it is superb and it includes lilting by Aoife Murray too – she’s fab. . . .back to the plot! I then realised there were two BIG and very major fiddlers who would basically hone my ‘style’ (whatever that is) forever. Bird Harper (Donegal) and Des Hurley (Leeds). 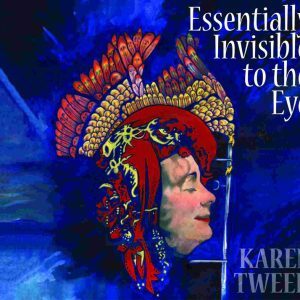 ‘Karen, you are going to need to play quieter, blend in, or else you won’t be welcome anymore,’ – or words to that effect. He hasn’t changed and his words really helped. 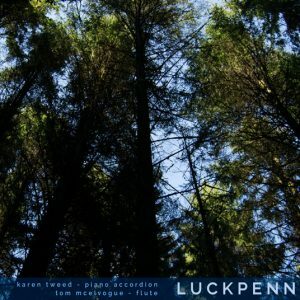 I’m not sure it was the easiest learning curve or politest critique but it made me think about my playing a lot. So (are you still awake???). . .listening and understanding how others play will show you how to create your unique voice and understand the magic of traditional music that we are all still learning how to play. After the Accordion workshops have finished I’m running a beginners’ melodica workshop. Melodicas will be provided and no experience necesssary. I love them and started on them at the age of 7. They seem quite trendy now and are certainly light and not only teach you basic keyboard skills but also breathing techniques, which are useful for going on further into woodwind / brass playing or even meditation. . . . you certainly can’t forget to breathe with a melodica, otherwise no sound comes out!! That workshop is also free to the accordion students but 3€ to anyone else. And talking of a unique voice have you heard TIM DALLING’S ‘Eve’s Bonie Squad’ CD yet? Genius, that man. Pure genius, beauty and blows me away every time. Then, SATURDAY NIGHT, it’s . 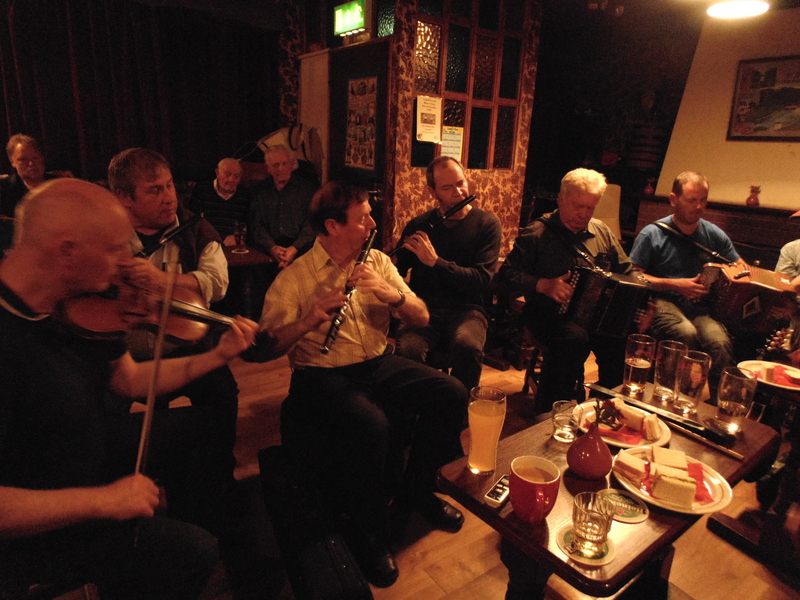 . . . .
We had a great ceili band practice in the Tally Ho Pub in Longford last night – what a band! For the ceili, there’s plenty of free parking near the Temperance Hall and for those up for a session afterwards, the plan is to hop over to Clondra and play more at the Camlin Bar by Richmond Harbour. SUNDAY is PoP Up Ensemble Day. 20€ – bring an instrument / voice and at 10am we’ll start putting together a concert of music and song which will be performed at 5pm that evening in the Longford Arms. Music notation and ABC for the melodies will be provided, plus words but the arrangements will be directed by ear on the day by myself and Nick Wiseman Ellis. It’ll be fairly mad, heaps of fun and using music from Ireland, Sweden, France and probably a tango. Spread the word, twitter away and I’ll say ‘Twoo Woo’ for now. That’s quite enough of a blog for one morning. Duck eggs are calling me. . .
there’s Ennis Tradfest and in November, I’m terribly excited to announce that May Monday are back on the road with a small but perfectly formed tour of middle England. More details soon. And finally, I’m starting a ‘Ceili and Folk Dancing Basics’ class at the Temperance Hall, Longford on Mondays at 7.30pm (starting Monday Oct 5th) – for the terrified or ‘I can’t quite remember how to Siege of Ennis’ people who’ve been badgering me to do a class for a while. We’ll look at the whole ceili and old time dance repertoire over the weeks leading up to Christmas and also a few French, Scandinavian and Eastern European dances so that should there be a Masked Ball ceili at Yuletide, you’ll be gliding onto the dance floor with confidence, OK? Classes are an hour long and cost 5€. You don’t need a partner and no experience necessary. Just turn up in your sloppy joes and come and have fun and exercise! Which reminds me, set dancing classes resume tonight at John Browne’s pub in Longford at 8pm. See you there! Ta da (as my great nieces and nephews say in Port Talbot). 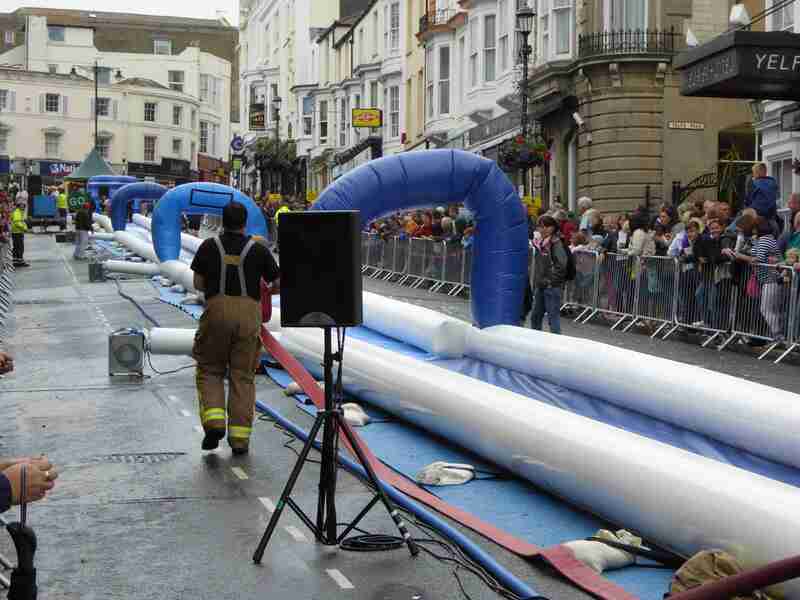 PS Thank you to Tony O’Nions for sending me (ages ago) this picture of the July Ryde Slide on the Isle of Wight! 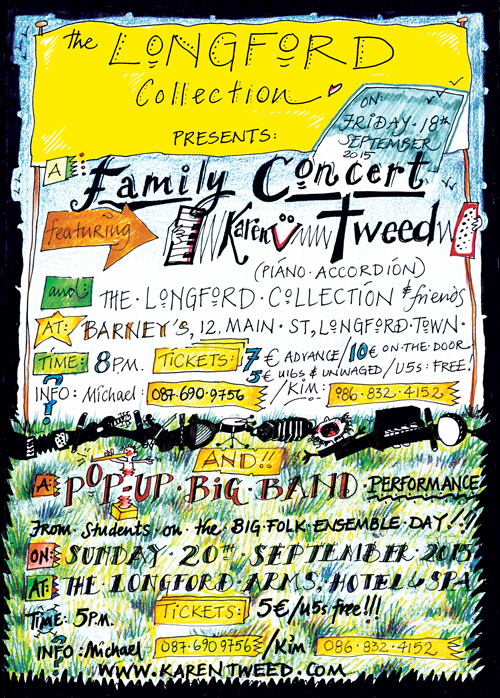 Friday 18th – Sunday 20th September : THE LONGFORD COLLECTION WEEKEND (in partnership with Karen Tweed’s Great Days. . . .
Concert Tickets : 7€ (advance) / 10€ on the door. 5€ under 16s and unwaged. Under 5s – free. and the Longford Tourist Office, Market Square, Longford Town, County Longford, Republic of Ireland. Saturday 19th September : WORKSHOPS and TALKS and MASTERCLASSES!!! Venue : The Longford Arms Hotel and Spa, Longford Town, County Longford, Republic of Ireland. 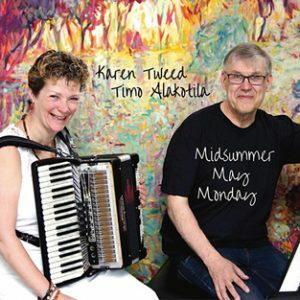 Music workshops from 10am – 4.30pm led by Karen Tweed (piano accordion) and Nick Wiseman Ellis (diatonic button accordion). 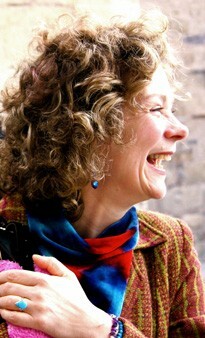 Karen will be concentrating on Irish traditional music techniques using repertoire from the Bunch Of Keys Tune Book 1, polkas, slides and perhaps a waltz as well. Nick will be concentrating on Irish traditional music, French and Swedish music. Notation and ABC notation will be available at the end of the day; however, you are encouraged to bring a notepad, pencil and recording device. All music will be taught in the workshops, by ear. All above events held at the Longford Arms. Accordion Classes student numbers are capped at 20 students. Tickets : 60€ for the workshop day. and the Longford Tourist Office, Market Square, Longford. 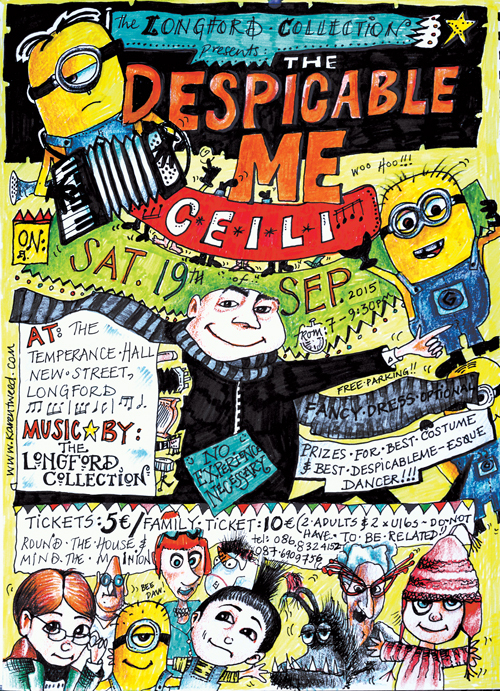 On the Saturday the evening, there will be a ‘Despicable Ceili’ (Round the House and Mind the Minions!!!) with prizes for the best dressed character from any of the DespicableMe Movies and certainly for the best dancer (in the style of DespicableMe). 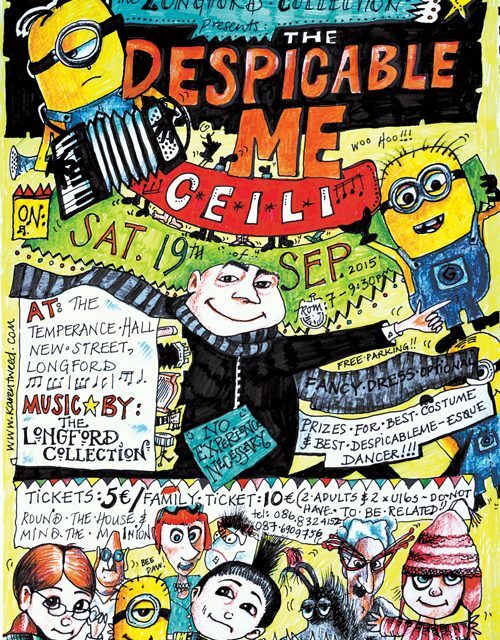 At The Temperance Hall, Longford Town. 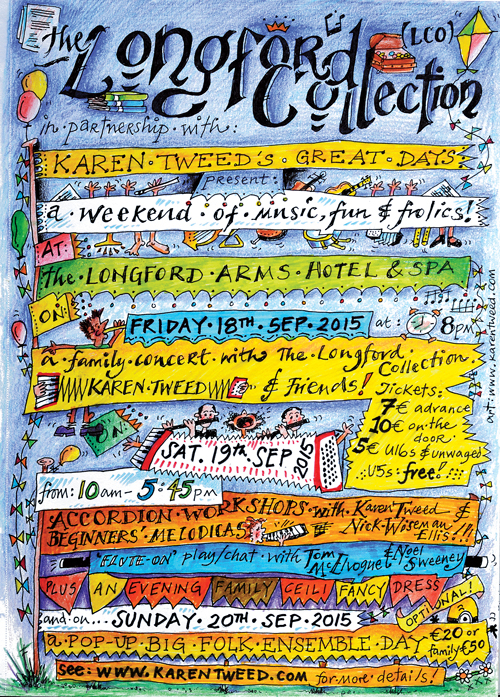 Music will be by The Longford Collection and many of the dances will be called so no experience necessary! 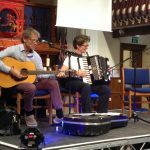 Music workshops from 10am – 3.30pm led by Karen Tweed (piano accordion) and Nick Wiseman Ellis (diatonic button accordion). Karen and Nick will be creating a performance big band (ALL instruments – including woodwind and brass welcome) which will perform in a public concert that day at 5pm. A kind of ‘Crikey, let’s get a move on!’ pop up instrumental and vocal workshop. No experience needed; but no absolute beginners on instruments, please. Bring your instruments and voices, a wee note pad and recorder if you have one. There will be notation for melodies and words for the songs but arrangements will be done by ear. and and the Longford Tourist Office, Market Square, Longford. A lively and fun popup big band created from today’s students and directed by Nick Wiseman Ellis and Karen Tweed. Expect madness, beauty and fun in music, vocals and spoken word. So if you’d like to come for the whole weekend, book in with the Longford Arms Hotel and Spa – great rooms, lovely food and heaps of free parking. Bang in the centre of town too! 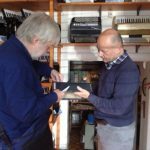 NB: The accordion workshops are limited to 20 students (we will split the group so that students get time with Nick and I individually – max 10 students in each class, and some sessions will be led jointly) so it may be worth booking sooner rather than later. If you are coming overseas and wish to borrow a box, email me at info@karentweed.com by Thursday 17th Sep.
2. Dromod / Rooskey Pike Angling Club are holding an Open Boat Pike Fishing Competition for the Brian King Perpetual Memorial Cup on Sunday 27th September at Dromod Harbour. Fishing from 11am – 4.30pm. Entries taken from 9am. Just thought I should pass this on to you about the New Rope string band playing for the last time locally as so many of you enjoyed the New Rope String Band at the Christmas party last year.